Aims: Cabraleadiol (1), Ocotilone (2) and Odoratone (3) are three triterpenes isolated from Cabralea canjerana (Vell.) Mart. (Meliaceae). They were chemically characterized, and their effect was tested on the light reaction of photosynthesis. Study Design: Natural products were used as models to find new models for inhibitors of photosynthesis. Place and Duration of Study: Departmento de Química, Universidade Federal de São Carlos and Departmento de Bioquímica, Facultad de Química, Universidad Nacional Autonoma de México, between May 2013 and January 2014. Methodology: The natural products had their effect on the light reaction of photosynthesis studied by pollarography and Chlorophyll a (Chl a) fluorescence transients. Results: The compounds inhibited ATP synthesis and electron transport rate (basal, phosphorylating and uncoupled). Therefore, they act as Hill reactions inhibitors. Their inhibition site were located in the range of electron flow from OEC complex and between P680 to QA of PS II, and inhibited the photosystem II (PS II) by inducing the appearance of a K-band which is an indicative that the photochemical apparatus is failing at the donor side of PS II interacting at the OEC complex and by transforming active reaction centers to “heat sinks” or the formation of silent reaction centers unable to reduce QA. Conclusion: Furthermore, these triterpenes inhibit PS II and induce the appearance of small G band which is related with the decreased plastoquinone (PQ) pool reduction. Photosystem II (PS II) is the membrane-protein complex which catalyses electron transfer from water to plastoquinone. The PS II complex consists of more than 20 proteins and six different active cofactors, including chlorophyll and a manganese site which is required for water oxidation. PS II electron transfer starts with the excitation of the reaction centre chlorophyll a species P680 to , and rapid electron transfer away from , via pheophytin, to the bound plastoquinone, QA, to form the pair . Electron transfer then occurs from QA to a second plastoquinone, QB. Following two turnovers, QB has accepted two electrons and taken up two protons  - . QBH2 dissociates from its site into the membrane pool of plastoquinone and is replaced by a new molecule of QB. extracts an electron from the oxygen evolution complex (OEC), via the electron donor YZ, tyrosine-161 on the D1 polypeptide. In the acceptor-side of PS II  - , photoinhibition is assumed to start when the plastoquinone pool connecting the two photosystems is reduced under intense light. Experiments leading to the formulation of the acceptor-side were done by illuminating PS II membranes with strong light under anaerobic conditions  , where the QA electron acceptor of PS II stays mainly in the reduced form and the reduced state can be stabilized by protonation or double reduction. On the other hand, the light-dependent photophosphorylation is coupled to electron transport rate and can be inhibited by different ways: by blocking the electron transport, by direct inhibition of the H+-ATPase, or by uncoupling the ATP synthesis process from the electron transport  . Within this context, several researchers reported the effects of different types of natural products as inhibitors of photosynthesis. Torres-Romero et al. in 2008  , found three sesquiterpenes that behave as Hill reaction inhibitors and weak energy transfer inhibitors and have two targets of interaction: one located at the oxygen-evolving complex, and the other located at the light-activated Mg2+-ATPase. The ambiguine D isonitrile caused increased reactive oxygen species (ROS) generation and was associated with observed lipid peroxidation and cell death. These oxidative processes probably play a key role in the phytotoxic action  . Three pentacyclic triterpenes isolated from Xylosma flexuosa had different mechanisms of action on photosynthesis. It acts as energy transfer inhibitors, interacting with isolated CF1 bound to thylakoid membrane, Hill reaction inhibitors and as an uncoupler, as determined by polarographic measurements  . Lupane triterpenes isolated from Melilotus messanensis possess potential allelopathic activity in particular on dicotyledonous species  , and the 3,4-secofriedelan-3-oic acid produced by Maytenus imbricata has been reported to inhibit several photosynthetic activities  . Various friedelane triterpenoids were evaluated for their photosynthetic inhibitory activity. The in vivo assays indicated that epifriedelinol and canophyllol act as selective post emergence herbicides at 100 μM by reducing biomass production in the weed Physalis ixocarpa  . Continuing with our studies    to find natural products with biological activity, we isolated a series of triterpenes from Cabralea canjerana (Figure 1). The chemical profile of Meliaceae family has found several types of compounds, like: coumarins, terpenoids and also many limonoids which were found frequently. Our aim is characterizing natural compounds that affect photosynthesis as a target and mechanism of phytotoxicity in vitro. We report here the effect of cabraleadiol (1), ocotillone (2) and odoratone (3) (Figure 1), on several photosynthetic activities to help us to elucidate their mechanism of actions in isolated spinach chloroplasts, measured with polarographic techniques and fluorescence induction curves of chlorophyll a (Chl a) of PS II. Figure 1. Studied triterpenes isolated from C. canjerana. The ethanol extract (70.0 g) of the fruits of C. canjerana was subjected to a liquid-liquid extraction with a 120 mL of solution (methanol-water [1:]">3]). The solution was extracted with different solvents to give us fractions in hexane (47.4 g), dichloromethane (5.4 g), ethyl acetate (4.4 g) and methanol (11.9 g). On the other hand, the ethanolic extract (14.3 g) of the seeds of C. canjerana was subjected to chromatographic column using microcrystalline cellulose-D (5.0 cm × 22.0 cm) as support. The mobile phase was composed by hexane/dichloromethane/ethyl acetate/methanol in ascending order of polarity, giving us eleven fractions. Cabraleadiol (1) and Ocotilone (2). These natural products were isolated as follow. The dichloromethane fraction (5.4 g) of the fruits of C. canjerana was subjected to a silica gel column (230 - 400 mesh, 4.0 cm × 16.0 cm), using hexane/dichloromethane/ethyl acetate/ methanol as mobile phase in ascending order of polarity, producing twenty fractions. The fraction seven (345.0 mg) was applied in a column of sephadex LH-20 (3.2 cm × 64.0 cm), with an isocratic mode of elution (methanol/dichloromethane [1:]">1]), producing four fractions, from the fraction two was obtained the compound 1 (24.6 mg). 1H NMR (δ, 400 MHz, CDCl3): 3.40 (t), H-3; 3.64 (dd), H-24; 0.98 (s), Me-18; 0.87 (s), Me-19; 1.15 (s), Me-21; 1.19 (s), Me-26; 1.11 (s), Me-27; 0.94 (s), Me-28; 0.84 (s), Me-29; 0.89 (s), Me-30. 13C NMR (δ, 100 MHz, CDCl3): 33.6 (C-1); 25.3 (C-2); 76.2 (C-3); 37.6 (C-4); 49.5 (C-5); 18.2 (C-6); 35.1 (C-7); 40.6 (C-8); 50.6 (C-9); 37.2 (C-10); 21.6 (C-11); 27.0 (C-12); 42.7 (C-13); 50.1 (C-14); 31.4 (C-15); 25.8 (C-16); 49.8 (C-17); 15.5 (C-18); 16.0 (C-19); 86.5 (C-20); 27.7 (C-21); 34.7 (C-22); 26.3 (C-23); 86.2 (C-24); 70.2 (C-25); 27.8 (C-26); 24.0 (C-27); 28.3 (C-28); 22.1 (C-29) and 16.5 (C-30). The fraction five (545.0 mg) was subjected to a chromatographic column (3.0 cm × 26.0 cm) using as stationary phase silica gel/florisil (1:1). The mobile phase was formed by hexane/dichloromethane/ethyl acetate/methanol in different concentrations, giving us five fractions (A-E). The fraction D produced 2 (85.0 mg). 1H NMR (δ, 200 MHz, CDCl3): 3.63 (m), H-24; 0.89 (s), Me-18; 0.95 (s), Me-19; 1.15 (s), Me-21; 1.12 (s), Me-26; 1.19 (s), Me-27; 1.08 (s), Me-28; 1.04 (s), Me-29; 1.01 (s), Me-30. 13C NMR (δ, 50 MHz, CDCl3): 39.9 (C-1); 34.6 (C-2); 218.0 (C-3); 47.4 (C-4); 55.3 (C-5); 19.7 (C-6); 34.1 (C-7); 40.3 (C-8); 50.0 (C-9); 36.8 (C-10); 22.3 (C-11); 25.0 (C-12); 43.3 (C-13); 50.2 (C-14); 31.4 (C-15); 26.9 (C-16); 49.8 (C-17); 16.0 (C-18); 15.2 (C-19); 86.5 (C-20); 24.3 (C-21); 34.8 (C-22); 27.1 (C-23); 86.4 (C-24); 70.3 (C-25); 26.8 (C-26); 27.1 (C-27); 26.4 (C-28); 21.0 (C-29) and 16.3 (C-30). Odoratone (3). The fraction II (2.50 g) of the ethanol extract of the seeds of C. canjerana was subjected to a silica gel/florisil column (1:1, 4.0 cm × 16.0 cm), using hexane/dichloromethane/ethyl acetate/methanol as mobile phase in ascending order of polarity, giving us eleven fractions (I - XI). The fraction III (480 mg) was applied in a column of sephadex LH-20 (2.5 × 70.5 cm), using methanol (100%) as solvent of elution to give us four fractions. The fraction two gives us the compound 3 (41.0 mg). 1H NMR (δ, 400 MHz, CDCl3): 1.92 (m), H-17; 7.59 (d), H-23; 3.96 (m), H-24; 0.86 (s), Me-18; 1.04 (s), Me-19; 0.85 (d), Me-21; 1.17 (s), Me-26; 1.15 (s), Me-27; 1.00 (s), Me-28; 1.11 (s), Me-29; 1.06 (s), Me-30. 13C NMR (δ, 100 MHz, CDCl3): 38.5 (C-1); 34.9 (C-2); 217.1 (C-3); 47.9 (C-4); 52.3 (C-5); 24.3 (C-6); 117.8 (C-7); 146.0 (C-8); 49.3 (C-9); 35.0 (C-10); 18.4 (C-11); 34.0 (C-12); 43.5 (C-13); 51.2 (C-14); 33.5 (C-15); 29.6 (C-16); 48.5 (C-17); 21.9 (C-18); 12.8 (C-19); 37.6 (C-20); 12.3 (C-21); 83.7 (C-22); 77.5 (C-23); 72.9 (C-24); 81.0 (C-25); 29.6 (C-26); 21.3 (C-27); 24.6 (C-28); 21.6 (C-29) and 27.8 (C-30). Intact chloroplasts were isolated from spinach leaves (Spinacea oleracea L.) obtained from a local market as previously described ">1]  . Chloroplasts were suspended in the following medium: 400 mM sucrose, 5 mM MgCl2, 10 mM KCl, and buffered with 0.03 M Na+-tricine at pH 8.0. They were stored as a concentrated suspension in the dark for 1 h at 4˚C. Intact chloroplasts were efficiently lysed to yield free thylakoids prior to each experiment by incubating them in the following electron transport medium: 100 mM sorbitol, 10 mM KCl, 5 mM MgCl2, 0.5 mM KCN, and 30 mM tricine ((N-tris[hydroxymethyl]methylglicine; N-[2-hydroxy-1,1-bis(hydroxymethyl)ethyl]glycine) buffer (pH 8 with the addition of KOH). Chlorophyll concentration was measured spectrophotometrically as reported ">3]  . ATP synthesis was determined titrametrically using a microelectrode (Orion model 8103 Ross) connected to a Corning potentiometer model 12, with expanded scale as reported elsewhere  . The ATP synthesis reaction medium contained 100 mM sorbitol, 10 mM KCl, 5 mM MgCl2, 0.5 mM KCN, and 1 mM K+-tricine (pH 8.0), 50 mM methylviologen (MV) was used as electron acceptor. Chloroplasts were added to a final concentration of 20 mg chlorophyll/mL. The reaction was started by illumination the chloroplasts with saturating light. Light-induced non-cyclic electron transport activity from water to MV was determined by using a Clark type electrode, as published, in the presence of 50 mM of MV as electron acceptor  . Basal electron transport was determined by illuminating chloroplasts during 1 min (equivalent of 20 mg/mL of chlorophyll) were lysed in 3.0 mL of the reacting medium: 100 mM sorbitol, 5 mM MgCl2, 10 mM KCl, 0.5 mM KCN, 30 mM Na+-tricine, and 50 mM MV at pH 8.0. The sample was illuminated in the presence or absence of 6 mM NH4Cl  . Phosphorylating non-cyclic electron transport was measured as basal non-cyclic electron transport except that 1 mM ADP and 3 mM KH2PO4 were added to the reaction medium. Uncoupled electron transport from water to MV was tested in the basal non-cyclic electron transport medium, and 6 mM NH4Cl was added. All reaction mixture was illuminated with actinic light of a projector lamp (GAF 2660) passed through a 5 cm filter of a 1% CuSO4 solution for 1 min. Electron transport activity was monitored with an YSI (Yellow Springs Instrument) model 5300 oxygen monitors using a Clark type electrode. The reaction medium was the same as in electron transport assay. Uncoupled PS II from H2O to DCPIP (2,6-dichlorophenol indophenol) was measured by the reduction of DCPIP supported O2 evolutions monitored polarographically. The reaction medium for assaying PS II activity contained the same basal electron transport medium in the presence of 1 mM DBMIB (2,5-dibromo-3-methyl-6-isopropyl-1,4-pbenzoquinone), 100 mM DCPIP/300 mM K3[Fe(CN)6], and 6 mM NH4Cl. Uncoupled PSI electron transport from reduced DCPIP with Na+-ascorbate to MV was determined in a similar form to basal non-cyclic electron transport medium. The following reagents were added: 10 mM DCMU (3-(3,4-dichlorophenyl)-11-dimethylurea), 100 mM DCPIP, 50 mM MV, 300 mM ascorbate, and 6 mM NH4Cl. Uncoupled PS I electron transport from reduced PMS (phenylmetasulfate) to MV was determined using KCN poisoned chloroplasts. The reaction medium was the same as in photosystem I except that 500 mM PMS/100 mM ascorbate was used as electron donor to P700 (PS I reaction center), MV as PS I electron acceptor, 10 mM DCMU as inhibitor to QB (secondary quinone electron acceptor of PS II), and 6 mM NH4Cl used as uncoupler to PS I. Cyanide treated chloroplasts were prepared by incubating chloroplasts for 30 min at 4˚C in 30 mM KCN and then centrifuged at 8000g (Sorvall super T21) for 1 min and resuspended in the reaction medium  . Moreover, EPR (electron paramagnetic resonance) spectroscopy confirmed the ability of reduced PMS to interact directly with P700. The I50 value for each activity was extrapolated using the graph of percent activity versus concentration of compounds. I50 is the concentration to produce 50% of inhibition. Chlorophyll a fluorescence was measured with a Hansatech Fluorescence Handy PEA (plant efficiency analyzer) in 10 min dark-adapted chloroplasts (20 mg/ml) at room temperature at 200 mM of triterpens ">1]  , using red light intensity (broad band 650 nm) of 2800 mmol∙m−2∙s−1, provided by an array of three light emitting diodes. The pulse duration was 2 s. To monitor Chl a fluorescence transients, aliquots of dark adapted thylakoids were placed by gravity on filter paper with a dot-blot apparatus (Bio-Rad, United States) to ensure a homogeneous and reproducible distribution of thylakoids in the filter paper, then the filter paper were dipped immediately in 3 mL of electron transport medium with 200 and 800 mM of the tested compound, the reaction medium used was as the same employed in basal non-cyclic electron transport measurements. To know if the triterpenes 1 - 3 inhibit ATP synthesis, all of them were assayed on photophosphorylation activity coupled to electron transport from water to MV in isolated freshly lysed spinach chloroplasts. Figure 2 shows that at increasing concentrations of the triterpenes, the synthesis of ATP decreased. The I50 values were 35.0, 17.5 and 67.0 mM for 1, 2 and 3, respectively. Figure 2. Inhibiting effect of terpenes 1 (¢), 2 () and 3 (p) on ATP synthesis. Control value = 100 % = 750 μM ATP/mg of Chl × h. Results are the average of three replicates. Figure 3. Effect of terpene cabraleadiol (1) on electron transport flow: basal (¢); phosphorylating (); uncoupled (p). Control = 100% = 400, 650, and 920 μequiv of e− × mg−1 of Chl × h, respectively. Each curve is the average of three replicates. Figure 4. Effect of terpene ocotilone (2) on electron transport flow: basal (¢); phosphorylating (), and uncoupled (p). Control = 100% = 760, 680, and 880 μequiv of e− × mg−1 of Chl × h, respectively. Each curve is the average of three replicates. electron flow of 41, 10 and 47 μM for 1, 2 and 3, respectively, being 2 the most active electron transport flow inhibitor. These results indicate that 1 - 3 act as Hill reaction inhibitors. To know one of the physicochemical property of the natural products, the Log P values was calculated with the program ACD/ChemSketch and their values were 7.90 ± 0.42, 7.33 ± 0.46 and 6.95 ± 0.51 for triterpenes 1, 2 and 3, respectively, in this case the compound with the major Log P shows minor activity as Hill reaction inhibitor, however compound 2 with the middle Log P value was the most active, may be this Log P value of 2 is the required to reach the target for inhibition. Figure 5. Effect of the terpene orodatone (3) on electron transport flow: basal (¢); phosphorylating (); uncoupled (p). Control = 100% = 756, 533, and 355 μequiv of e− × mg−1 of Chl × h, respectively. Each curve is the average of three replicates. Table 1. Effects of triterpenes  - on PS II electron flow and its partial reactions. transport chain, because reduced DPC donates electrons to P680  . Triterpenes have no effects on PS I electron flow measured from reduced DCPIP to MV (data not shown). To corroborate the interaction site of triterpenes at PSII, freshly lysed chloroplasts were incubated for 5 min in the dark at room temperature at 200 mM of the compounds, 10 µM DCMU, and 0.8 M Tris, which were used as positive controls (Figure 6). The thylakoids control showed a polyphasic fluorescence curve with OJIP sequence of transients similar to that previously described for plants, green algae, and cyanobacteria  ; the addition of 10 µM of the herbicide DCMU induces a fast rise of the fluorescence yield during the first 2 ms of illumination; it transforms the regular OJIP sequence into an OJ curve (Figure 6)  . When the thylakoids are treated with Tris, a well-known donor side of PS II inhibitor  (Figure 6), the fluorescence induction curve change and the maximum fluorescence yield was reduced and the K-band appears, a rapid rise to a maximum (at 300 µs) followed by a decreased fluorescence yield to level close to F0 (Table 2). All other steps, J and I are absent from the transient   . The tris-treated thylakoid conditions are shown also by heat-treated chloroplasts where the OEC damage occurs. Figure 6. Fluorescence of Chl a rise kinetics of freshly lysed broken chloroplasts infiltrated with 10 µM DCMU (r), and tris-treated thylakoids (). Control chloroplasts (¢) are shown for comparison. Chl a fluorescence induction curves were measured at room temperature. Details are in Materials and Methods. Data are averages of five replicates. Figure 7. Effect of the compounds at 200 µM, (panel (a)) 1, (panel (b)) 2 and (Panel (c)) 3 on the OJIP curves, close symbols represent control and open symbols are the samples treated with the terpenoids. Panel D shows bands K (0.3 ms) and G (near 300 ms) obtained with the normalized relative variable fluorescence of chlorophyll a of thylakoids infiltrated with 200 µM of terpenoids 1 (¢), 2 () and 3 (p). Each curve is an average of five replicates. Table 2. Experimental average values ± standard deviation of chlorophyll a fluorescence obtained in control and treated chloroplasts with DCMU, tris buffer and natural products at 200 mM. The values correspond to traces in Figure 6 and Figures 7(a)-(c). reducing the maximum fluorescence approximately by one third (Figure 7(b)). Analysis of the difference of each curve from control on relative variable fluorescence when the OP phase was normalized between FM − F0 = Vt = (Ft − F0)/(FM − F0), shows a K-band (Figure 7(d)), being bigger for compounds 2 and 3, and lower for 1, this band is an indicative that the compounds 2 and 3 damaged the water splitting enzyme system  . However, 1 affect this OEC site but in minor proportion. Furthermore, a band in the IP region appeared (near to 300 ms) (Figure 7(d)). And, the derived parameters from the transients obtained with the substances (Table 3), were decreased by 2 and 3, i.e. the yields as jPo decreased in 11 and 7%, jEo 32.5 and 20%, and yEo decreased 25 and 14 % with both compounds, respectively (Figure 8); the most affected parameter was the performance index up to the PS I end electron acceptors (PITotal), this parameter was decreased 60 % by 2 and 27% by 3, but 1 has no-effect on it. Parameters as jDo, dRo, ABS/RC, TRoRC and Mo were increased, being the most affected the parameters Mo and jDo, they were increased 148 and 29% respectively by 2. The absorption by reaction center (ABS/RC) increased 40 and 20% with 2 and 3 respectively. Compound 1 also affect these parameters but in minor proportion (Figure 8). These results show that the absorption by reaction center is increased due to damage on the donor site of PSII induced by 2 and 3 and in minor extent by 1. Table 4, shows the fraction of active reaction centers after the treatment with the compounds at 200 mM and calculated as [(ABS/RC)C/(ABS/RC)T × 100], where (ABS/RC)C means for control value and the (ABS/RC)T means the treatments values. These results corroborate that 1, 2 and 3 (200 μM) affect the donor side of PSII by transforming active reaction centers to “heat sinks” (silent reaction centers) or non active reaction centers. In the other hand, the small band in the I-P region appeared (near to 300 ms), G band appears (Figure 7, Panel D) and it is related with the plastoquinone (PQ) pool reduction, indicating that the terpenoids decreases the available electrons to reduces QA, as well as, the PQ pool as a consequence of the formation of non active reaction centers. The compound 2 was most potent as inhibitors than 1. The difference in structures between 1 and 2 is the presence of the carbonyl group at C3 of 2, which may be is necessary for activity, while at the compound 1 have a hydroxyl group. On the other hand, odoratol had its mechanism of action site located at the donor side of PS II  and the (I50) value on ATP synthesis for odoratol was 67 µM. This compound has a similar structure to odoratone (3), which had a calculated I50 value of 35 µM. Thus, we can suggest that the presence of the carbonyl group is very important for inhibition and increases the potency of the natural product on photosynthesis and suggest that will be useful for herbicidal activity. In this study we have demonstrated that three triterpenes (1 - 3) isolated from Cabralea canjerana, act as a Hill reaction inhibitors in a similar way as other natural products such as lasiodiplodin  and siderin  . Polarographic measurements and chlorophyll a fluorescence measurements indicate that 2 and 3 inhibited partially the water-splitting enzyme, and have their sites of interaction localized the range electron transport from P680 to QA and also inhibited the donor side of PS II, at the OEC complex. Therefore, these compounds may be good candidates as lead structures, which could be optimized for the development of new herbicides. Table 3. 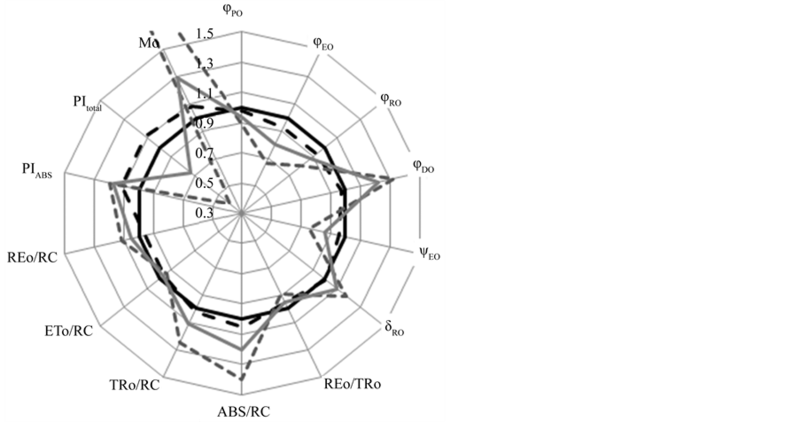 Derived parameters, their description and formulae using data extracted from the chlorophyll a fluorescence (OJIP) transient presented in this work. Figure 8. Radar plot showing the effect of 200 mM of terpene 1 (black dashed line), 2 (grey dashed line), 3 (grey continuous line) of the derived parameters calculated from the OJIP transients presented by dark-adapted freshly lysed chloroplasts. Control is represented by a continuous line at the center of the radar. Table 4. Active Reaction Centers calculated as [(ABS/RC)C/ABS/(RC)T] × 100 in control and treated chloroplasts with terpenoids 1 - 3. The authors thank the financial support of the DGAPA-UNAM IT102012-3, #FAPESP (Fundação de Amparo à Pesquisa do Estado de São Paulo), #CNPq (Conselho Nacional de Pesquisa e Desenvolvimento) and #CAPES (Coordenação de Aperfeiçoamento de Pessoal de Nível Superior). Authors have declared that no competing interests exist. Diner, B.A. and Babcock, G.T. (1996) Oxygenic Photosynthesis: The Light Reactions. Kluwer Academic Publishers, Dordrecht, 213-247. Britt, R.D. (1996) Oxygenic Photosynthesis: The Light Reactions. Kluwer Academic Publishers, Dordrecht, 137-159. Good, N.E., Izawa, S. and Hind, G. (1981) Current Topics in Bioenergetics. Academic Press, New York, 75-112. Mills, J.D., Mitchell, P. and Schurmann, P. (1980) Modulation of Coupling Factor ATPase Activity in Intact Chloroplasts. FEBS Letters, 191, 144-148. Allen, J.F. and Holmes, N.G. (1986) Photosynthesis: Energy Transduction: A Practical Approach. IRL Press, Oxford, 103-141. Saha, S., Ouitrakul, R. and Izawa, S. (1971) Electron Transport and Photophosphorylation in Chloroplasts as a Function of the Electron Acceptor. Journal of Biological Chemistry, 246, 3204-3209. Strasser, R.J., Tsimilli-Michael, M. and Srivastava, A. (2004) Chlorophyll Fluorescence: A Signature of Photosynthesis. Kluwer Academic Publishers, Dordrecht, Chapter 12, 321.